Bless you! published on November 2, 2015 Rachel2 Comments on Bless you! Note: This post contains no spoilers! Although we already did a comic about the concept of ‘Legacy’ games two weeks ago, this was one of those ideas that just needed to be published. 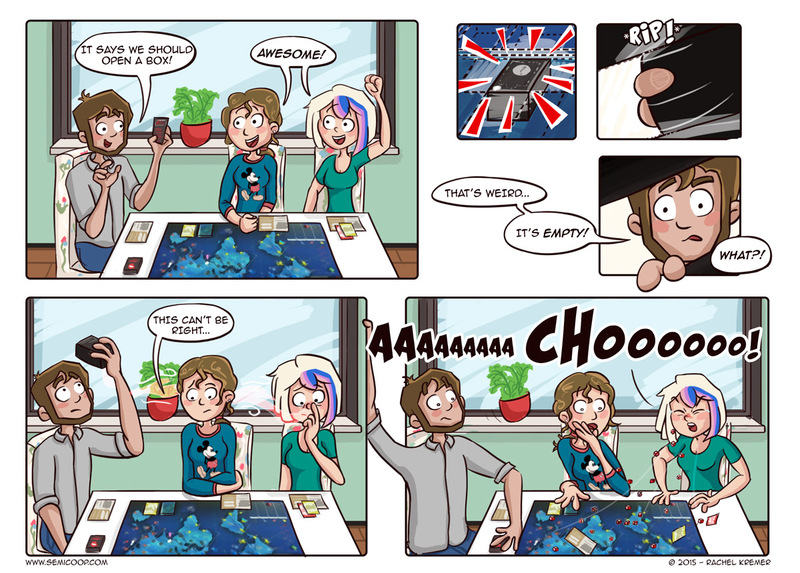 😉 At first I wanted to be further along in the game before making a comic about Pandemic Legacy, but since the comic shouldn’t contain any spoilers there was no reason to wait. We’ve only just started playing Pandemic Legacy, but I can already tell that the game is very exiting. There is something very unusual and thrilling about playing a board game of which the rules / situation of the game might change suddenly at any point. In the beginning you try to put stickers on the game with great precision. You feel like a rebel the first time you rip up a card because the game tells you to. You try to write at your prettiest the first time you have to write on cards or on the board… but you will probably fail at that because most pens don’t write very smoothly on the surface of the cards. We both greatly recommend this game to everybody who likes Pandemic! There’s a translation error on the ‘Flexible’ upgrade sticker you can put on a character sheet. Translated to English it basically says: “For an action you may discard a card and pick one of your choice from the discard pile.” instead of “For an action, discard a card to draw a card of the same color from the player discard pile”. Click here for picture. We already thought that this upgrade was very powerful and noticed that its translation was faulty when seeing the spoiler-free review of Shut Up & Sit Down. We’re hoping there aren’t any other translation errors that might throw off the balance of the game!